The Fujifilm instax mini 9 has taken over! Everyone’s favourite selfie camera has everyone wanting to be part of the photo action. Easy to use? Check. Selfie mirror? Double check. Our iconic, fun cameras have loads of fun accessories and ways to make your next photoshoot even more exciting. To turn on the camera, just push the button next to the lens, and push it back into the body of the camera to turn it off. So easy! You’ll notice the right side of the camera is rounded for an easy grip and can help you take pictures both in landscape or portrait mode. 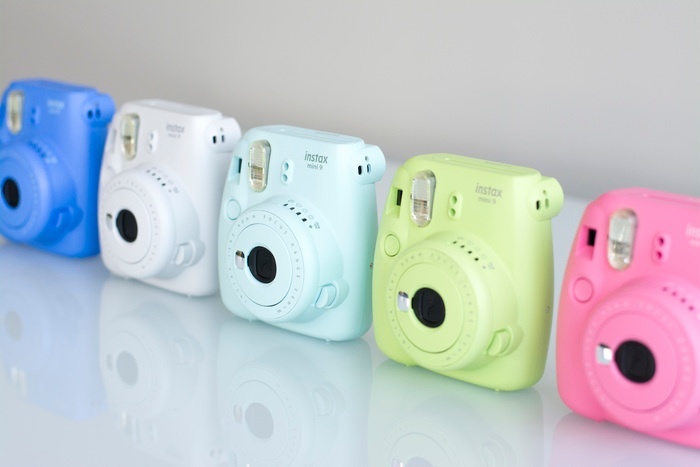 Now you can take close-up pics with your instax! The instax mini 9 comes with an attachable close-up lens that lets you take close-ups between 35-50cm. This lets you get a close-up with better photo quality. As you know, sometimes getting too close to your subject can affect the focus and make your pic turn out blurry. Not any more! While the brightness adjustment dial has four main settings that are suggested based on the ambient light, there is one setting it never recommends by itself. High-key mode is an extra setting that brightens and softens your image and should ideally only be used indoors or in places with little light. Regardless of what brightness setting you use, the instax mini 9’s built-in flash will go off. Have you ever noticed the two holes in the front of the camera? That’s a light meter that determines how intense the ambient light is. Make sure you don’t cover these holes when taking your picture, or it probably won’t turn out as lovely as it could! One of the most fun features of the instax mini 9 is the selfie mirror. Don’t worry—you can fit more than one person in the mirror for the best selfie ever! Although it seems small, lean in close and smile! The instax mini 9 is a fun, compact camera you can take with you whenever you’re hanging out with your mates! The selfie mirror is a huge help in getting those pics of the group, just make sure you’re doing it right. Want to learn how to perfect your selfie skills? Check out our free Selfie guide, and get our tips and tricks today!